Recently I have been getting a bit of pit work from a nearby community theater. They like to do month-long runs of their shows, which means that the musical director often hires two or more people for each seat in the orchestra, so that they can trade off playing the show according to their availability. One little perk of this method is that often the woodwind player who does the first show leaves his or her instrument stands in the pit for the other doubler(s) to use, so I’ve gotten to try out a variety of stands lately in a real-life situation. I have, of course, a number of stands of my own, most of which do a basically satisfactory job, but none of which I’m overwhelmingly enamored with. My main workhorse stand is by Belmonte, and looks something like this. Mine is a few years old and it looks like there may have been a few minor design changes. It holds an alto and a tenor saxophone (or two altos or two tenors—the bell rests adjust to alto or tenor positions), plus a flute and clarinet (or two flutes, or two clarinets). It folds up, sort of, and you can take all the instrument pegs out for even more compact storage/transport. When my old one wore out, I called the company and they sent me a new one with no hassle. I didn’t even have to ship them the old one. It’s not tremendously sturdy; the hinges tend to get a little loose after a while. It has the typical “combo flute/clarinet peg” problems. My clarinet sometimes gets wedged onto the base of the peg, and in some cases I grab the upper joints of the clarinet, leaving the lower joint and bell still on the stand. Plus, the upright is too narrow to hold my flute without wobbling. There isn’t any chance of it falling over or anything, but I’d like it to fit the bore of my flute more closely. It won’t fold up right with both saxophone pegs installed. You have to take one out, then fold it up, then try to stick the peg back in. 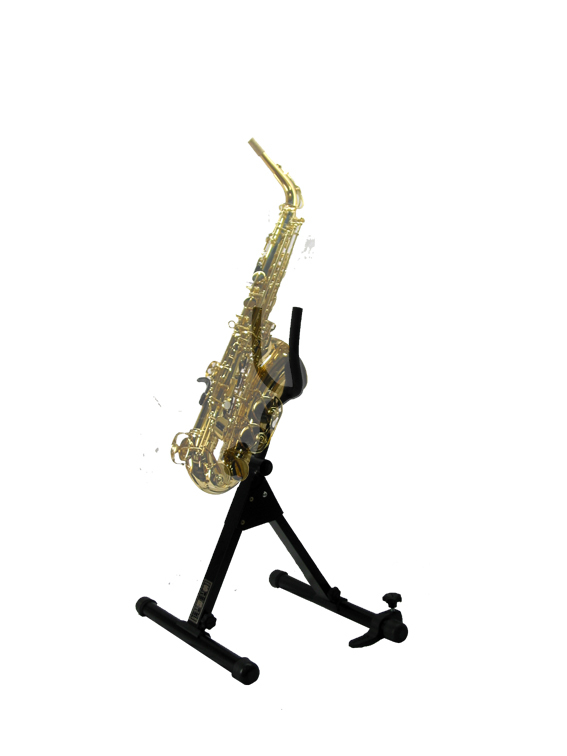 I have the Belmonte baritone saxophone stand, too, and like it pretty well, though I suspect it will similarly suffer from wear and tear. It has a nice small footprint if you only need one saxophone, and the tripod-style legs are handy when you’ve got music stands, microphone stands, chairs, and cables running everywhere. The instruments are too close together. This contributes to the compactness of the stand, but I really need another couple of inches so that I can make quick switches without having to maneuver instruments into and out of such tight spaces. Usual flute/clarinet peg problem; it would be nice to have a real clarinet peg and a real flute peg rather than the either/or peg. But of course there is more to life than flute-clarinet-saxophone doubling. I invested in a K&M folding base that accommodates four pegs, and several pegs to go with it: piccolo, flute, oboe, English horn, and clarinet. It’s totally modular, so you just buy the pegs you need. It’s a pretty inexpensive way to get a quasi-custom setup for smaller woodwinds. They make two different piccolo pegs, a narrower one for conical (wood/plastic) instruments, and a wider one for cylindrical (metal) instruments. It arranges the instruments in a square, so you end with some instruments farther away and have to reach through a forest of woodwinds to grab what you need. I bought the narrow piccolo peg and broke it almost immediately. The upright part is nothing more than a black-painted piece of very thin dowel. I’ve had some quality problems with the the hardware; my oboe peg is permanently stuck to the base, and the English horn peg hardware has become detached from the wood. I also have the K&M bassoon/bass clarinet stand, the one with the big rubber bowl at the bottom, rather than the hard metal ashtray thing. It’s very sturdy and stable. It’s quite adjustable, and really does work quite well for either bassoon or any of the large clarinets. I can’t seem to set it up without pinching a finger somewhere in all the moving parts. It’s expensive, over $100 last I checked. At a recent gig, I used one of these Hercules flute-piccolo-clarinet stands that belongs to a friend. Hercules makes a variety of stands, but this is the only one I’ve used personally. It seems quite stable and pretty sturdy. Their saxophone stands seem to be well-regarded in this department, too. The Hercules stands all seem to be very reasonably priced. It arranges the instruments in a triangle, so the best you can do is have two instruments toward you, and one farther away that you have to reach around or between to get to. My flute feels really unstable on the skinny little peg. Some other items I use: a Manhasset music stand shelf (works great on Manhasset music stands, won’t work at all on Wenger stands) for piccolo, mouthpiece caps, or reed paraphernalia; a drumstick caddy (basically a cup that clips onto a stand) for recorders, whistles, or piccolo; and several of those little plastic BG folding stands, which obviously are neither sturdy nor reliable, but which have the advantage of folding completely flat so they’re easy to carry in a clarinet or oboe case. Haven’t tried them myself yet, but I’ve heard good things about these SaxRax stands, such as that they are ultra-stable and ultra-tough. They are also highly customizable depending on what parts you buy. And highly expensive! Maybe someday. Another downside: no double reed or piccolo pegs. 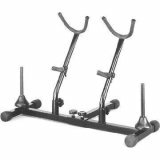 The Blayman stands seem to be the gold standard for heavy, solid stands for small woodwinds, but of course they are expensive, and their multi-peg bases tend to arrange the instruments in triangles or squares. Solid, heavy construction. Lots of instrument stands seem to advertised as “lightweight,” but I think this is a case of selling a bug as a feature. I suppose it would be nice to carry feather-light stands between the car and the venue, but then again I’m probably already making two or more trips schlepping instruments anyway. Modular design, so I can buy just the pegs that I want, and bring just the ones I need to the gig. 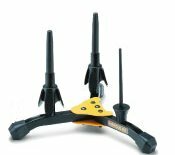 This has the added advantage of making well-designed, instrument-specific pegs possible, even pegs designed for specific models of instruments. Instruments arranged in a line (or curve, perhaps), rather than a polygon, and with a good balance of keeping the instruments far enough apart and keeping the stand’s footprint small. Legs (perhaps removable?) that lift the stand off the floor by an inch or two, to allow for cables and other pit-floor clutter. I like instrument pegs padded with something soft, for protection and for silence. Felt is my favorite where practical, but it seems too slippery to hold a saxophone by the bell. How about pegs I can see in the dark? I think a white or even glow-in-the-dark dot at the tip of each peg would be subtle enough to honor the traditional all-black pit look, but aid tremendously in getting an instrument onto the stand quickly in low light. Perhaps peg extensions, so that I can decide how high my instruments are? Some piccolo stands are built this way, with a piccolo peg atop a taller riser, so you don’t have to reach down to the floor. Relatively inexpensive would be nice, too, as long as I’m dreaming. I’ve always been a fan of the K&M individual instrument stands. I used to have a difficult time locating them in the dark during a show until I put a small ring of neon electrical tape on each of them. I like the fact that they’re each small and portable, and that I can position them wherever I want, in any number of possible configurations. I also like that I can use their clarinet stand for oboe or english horn. I agree with your comment on the K&M bass clarinet stand. It’s HUGE, and I really wish it was black. I see almost 3 years have passed since this item was submitted. I am now trying to find a combi stand for 2 clarinets and a flute and came across this very useful item. Thanks. There is still no decent stand out there as far as I can find. Hi Marilyn—thanks for stopping by. Something like the K&M base or one of the Blayman bases should work well, since you buy the pegs separately and can choose whatever you need. Searched for your suggested items – either too expensive or not available in UK. I often use The Woodwind and the Brasswind here in the US. They are competitively priced and do ship internationally. I hope you find something that works for you. I recently played in an extremely dark pit, where the pegs were all but impossible to find for quick switches after looking at my more brightly lit stand. I used glow in the dark spray paint on the tips of the pegs, and it made them much more visible, both due to the slight glow as well as the fact that the translucent paint has a slight white tinge. And, the paint did NOT come off inside my instruments at all, as I had feared it might. It seemed to work equally well on wood and plastic, as well as on one peg I have that is some sort of rubberized material. I honestly prefer separate stands for all my instruments rather than combi-stands! I own two hercules tenor/alto stands, a hercules bari stand, a K&M picc stand (which screws to a music stand), K&M compact flute stand, unbranded clarinet stand (which packs into the bell), hercules soprano sax stand and my next purchase will be a bass clarinet stand (probably the hercules) once I’ve picked up my instrument. This means I have total control of where I put my instruments, with multiple options depending on the doubling gig. I can also adapt to different sizes of pits – it’s easier to fit myself around other stands/chairs/instrument stands etc.